Enjoy the beautiful water front location of the Oregon Convention Centre while promoting your business in Portland. Across the water is Downtown and the happening Pearl District, giving you easy access to both business and pleasure. Maximize your potential by taking advantage of our excellent selection of exhibiting solutions and trade show displays, and then enjoy one the many craft microbreweries that this hip gem of the Pacific North West has to offer. We take pridce in providing our customers with innnovative and inspiring exhibiting solutions so that you can make an impact while promoting your products and services in the San Francisco market! Where is the Portland Convention Center Located? The Oregon Convention Center is located at 777 NE Martin Luther King Jr Blvd, Portland, OR 97232. It is is the largest convention center in Oregon, and home of the largest and most electric trade shows in the region. It is located on the east side of the Williamette River in the lovely Lloyd District. Importance of Trade Show Booths? 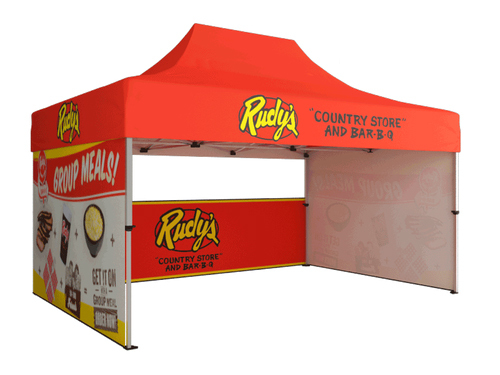 Trade shows booths can be the stepping stone to your product or service being a huge success. Trade show booths allow you to present your product or service to a large group of people and meet with people who can take your product or service to the next level. With that being said, trade shows do cost a decent amount of money to attend. It costs money to hire staff, travel to the trade show location and to design your trade booth. Setting goals is important for any product or service. Without goals, it is very hard to become a success and to market your product or service properly. Once you have figured out your goals, it is important that your trade booth helps you reach these goals while exhibiting in Portland. How to stand out in Portland? A produce or service's uniqueness is often what leads to its success. If there are hundreds of products or services just like yours, then most people won't find your product or service interesting. If your product or service is unique, then you should use that to your advantage and mention it on your trade show display. Tailoring your offering to the market in Portland will ensure you have maximum success!